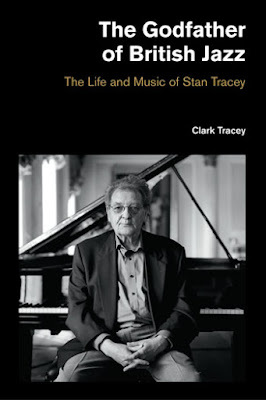 ‘A unique man in music, who doggedly said it his way, come what may … a true example of an original and passionate artist who, ultimately, wanted little more from life than to play the piano with friends.’ This is the way the life and work of Stan Tracey are summed up by his son Clark Tracey at the end of this sensitive, thoughtful and meticulously detailed biography. Drawing extensively on his father’s diaries, Clark traces Stan’s life from his birth in Dulwich in 1926 through to his death in December 2013, dedicating an introductory chapter to his south London childhood, but quickly moving on to his jazz career, via stints as an accordionist with ENSA (the organisation set up to perform for British troops in the Second World War, the Entertainments National Service Association, or, as it was popularly known, Every Night Something Awful); post-war call-up into the RAF (where he worked with the Ralph Reader Gang Show and first encountered the likes of Tony Hancock and – a lifelong friend – Bob Monkhouse); service in ‘Geraldo’s Navy’, the transatlantic-liner work that enabled him to sample New York jazz first-hand; and then immersion in London’s jazz world with the likes of baritone singer Barry Martin, drummer Laurie Morgan and, subsequently, Kenny Graham, Vic Ash and the larger units of Basil Kirchin (‘the Biggest Little Band in the Land’) and Ted Heath (‘stifling … Ted was a very stiff and autocratic leader’). By 1960, however, Stan was homing in on the jazz work that really interested him: weekly gigs at the famous Flamingo, a record date with Tony Crombie’s Jazz Inc. octet and a Decca EP with the MJ6 (Modern Jazz Six), and by 1961 he was working regularly at Ronnie Scott’s club, backing Zoot Sims, Lucky Thompson and other visiting Americans. Having thus established himself as a highly original, gifted pianist with a pungently individual, immediately recognisable style, Stan went on to record what is still his most celebrated work: Jazz Suite: Under Milk Wood. It would be tempting at this point to say that the rest is history, but it is the great strength of Clark’s book that it documents Stan’s career in such unflinching, unswerving detail, with all its frustrations, rebuffs and setbacks (mostly the result of the establishment’s apparent determination to ignore or undervalue jazz), that it never becomes a routine hagiography, a simple list of achievements. Instead, Clark’s personal perspective enables him to bring the career of his father to vivid life, via a wealth of direct quotations from the man himself on subjects including his wife Jackie’s indispensable support (both for him and for British jazz generally), his struggle with heroin addiction, the attitude of the musical establishment to his music, the often parlous state of the pianos upon which he was expected to perform, ‘free’ music and its effect on his musical outlook, his supposed debt to Thelonious Monk and Duke Ellington, the support of fellow musicians etc. etc. Like the music (and life) of its subject, Clark’s biography, which is supplemented by an admirably thorough discography, is single-minded, almost dogged, in its purpose: unsentimentally and dispassionately to document the career, in all its sometimes uncomfortable detail, of one of this country’s greatest musicians. It’s a considerable (and valuable) achievement.